Oyster is a near-shore wave energy device, typically deployed in 10 to 15 metre (m) water depth. The oscillating action of the waves against the wave energy converter (WEC) (or ‘flap’) drives hydraulic pistons which pump pressurised freshwater back to shore through a closed loop pipeline system. Oyster 800 is 250% more powerful than Oyster 1, simpler to install, easier to maintain and more efficient. The Oyster 801 and Oyster 802 devices will further refine the design of Oyster 800. Det Norske Veritas (DNV), the world's leading international provider of services for managing risk, awarded a Statement of Feasibility for the design of Oyster 800 in 2010, based on a 20 year life span. 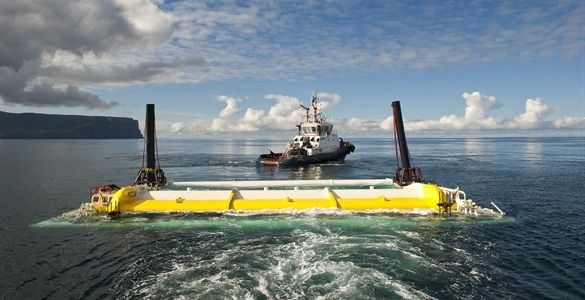 This was the first time DNV awarded this accreditation to a wave power device. Fabrication of Oyster 800 was completed and unveiled by Scotland's First Minister in July 2011. The Offshore installation was completed in August 2011. Operational testing of Oyster 800 commenced in June 2012, producing first electrical power to the grid the same month. Aquamarine Power subsequently went into administration in October 2015 and was unable to secure a buyer for the business by November 2015 and therefore had to cease trading. Onshore planning permission: Granted by Orkney Islands Council, September 2010. Offshore consents: Granted for first of three Oyster devices by Marine Scotland, December 2011 and for the further 2 devices in February 2012. Environmental Impact Assessment: Completed by Xodus Environment, June 2011. No issues were identified as being of major or severe significance. Oyster 800 at EMEC is located in United Kingdom. Basking sharks have been recorded in the surrounding environment and within 600m of the development. Basking sharks are listed as vulnerable on the IUCN red list and are fully protected under Schedule 5 of the Wildlife and Countryside Act (1981) against disturbance in British waters. All seabird species which qualify as interest features of Hoy or Marwick Head SPA have been selected for assessment due to their ecological significance and high sensitivity. In addition to SPA species, other potentially locally or regionally significant species have been selected. Assessment of underwater noise from Oyster 2 installation (Subacoustech, 2010). Underwater noise impact assessment (Xodus, 2010a). Assessment of underwater noise from latching anchor drilling (Subacoustech, 2011). Analysis of wildlife monitoring (Craigton Ecological Services, 2011). Marine wildlife impact assessment (Xodus, 2011a). EMEC marine wildlife data summary report (Xodus, 2011b). Restrict the area of kelp removed to the footprint and immediate vicinity of the Oyster 2b and Oyster 2c devices and associated seabed infrastructure. Design of anchors (rock, latching and stabilization) will be to the minimum practical depth in order to reduce the volume of drill cuttings discharge. Ensure all Aquamarine Power emergency procedures are in accordance with EMEC SOPs and Emergency Response Plans. Where appropriate, vessels will have onboard SOPEPs, or equivalent procedures and will comply with IMO/MCA codes for prevention of oil pollution. Vessels will carry oil and chemical spill mop up kits. Installation and major routine (planned) maintenance activities will only take place in instances where Aquamarine Power are confident that there is no risk of bad weather to avoid incidences leading to an increased risk of accidental/non routine events. Where possible, vessels & skippers with an established track record of operating in similar waters where the conditions can become severe over a short period of time will be employed. They will also be familiar with operating conditions in the area and will adhere to all appropriate navigational standards and practices. Broadcast all works by appropriate Notices to Mariners and Navigational Warnings. Comply with EMEC notifications procedure. Hold a HIRA meeting/workshop with EMEC, to be attended by all contractors. Communicate the method statement for the works with EMEC. Consider arrangements for notification of installation activities to specific local sea users, such as Orkney Marinas and Stromness Sailing Club. The shallow water test site should be charted as a separate area (maintaining a clear and adequate inshore channel) in order to show the extent of the possible hazards presented by the installation of devices there (EMEC/UKHO). The starboard lateral buoy should be replaced with a special mark (only providing the recommendation above is undertaken) (Aquamarine Power). The UKHO should change the coverage of the relevant charts to ensure that the nature of hazards contained within the wave test site and other proposed marine renewable energy developments on the west coast of mainland Orkney are appropriately charted. Continue wildlife observations post installation to aid understanding of potential impacts on marine wildlife from the Oyster technology. Measure the underwater acoustic signature of the Oyster 2 array. Anchor (rock, latching and stabilisation) design will aim to minimise drilling time (and therefore period over which disturbance may occur) without compromising the technical performance of the anchor. During an operation involving vessels, vessels will move slowly onto site and remain slow moving or stationary throughout the installation or maintenance period.